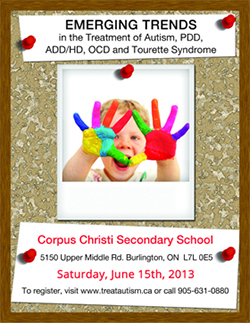 On May 14th, at the Burlington Art Centre was host to the 2nd Annual Treat Autism & AD/HD Biomedical Conference. For those who attended, hearing two pediatricians speak about their biomedical journey was both inspiring and informative. Dr. Julie Buckley, MD, author of Healing our Autistic Children, and Dr. Wendy Edward, MD, both have children with autism who have benefited greatly from biomedical intervention. Dr. Buckley reviewed some of the incredible research that is changing the way autism is viewed by the traditional medical community. She explained the research behind B12 therapy and treatment of the digestive tract and how biomedical treatment is helping to recover children, including her own. With a wry southern wit, this Jacksonville native, helped local southwestern Ontario parents to learn more about why children with autism are plagued with physical complaints like digestive issues, skin problems, lowered immunity and insomnia. In the afternoon, Dr. Wendy Edwards, MD, highlighted her top treatments for children on the autism spectrum based on her professional and personal experience. Dr. Edwards, a poised and seasoned speaker took us through her own journey as a health care professional who changed her medical philosophy when confronted with her son’s autism diagnosis. In an incredibly inspiring talk, she outlined her son’s success with biomedical treatment and the Son-Rise program. Dr. Edwards also helped the attendees look forward to some of the exciting therapies the future may hold for children suffering unrelenting digestive and immune dysfunction. For parents of children on the autism spectrum who have long been told there is no medical treatment for autism, this parent focused conference was a rare opportunity to have the support of traditionally trained physicians who acknowledged the changing view of autism as a “whole body disorder”. The take home message was “there is hope for all children with autism to have significant developmental gains with biomedical treatment”.